Unfortuneately it was not included with this PC. Edited by brewsrgr8, 16 February 2013 - 09:36 AM. Unfortuneately it was included with this PC. IMPORTANT - Disable your AntiVirus and AntiSpyware applications, usually via a right click on the System Tray icon. They may otherwise interfere with our tools. If you have difficulty properly disabling your protective programs, refer to this link here. Accept the disclaimer and allow to update if it asks. When I attempt to run Kaspersky my PC shuts down. Please download aswMBR.exe to your desktop. Note: If avast! antivirus is already installed, just do the next step. Also on Desktop there should be a file called MBR.dat after that. Please attach it here. OK, but wait, the 3rd time I ran it worked...I think... a report generated but then the PC shut down. Would you like the report (you'll have to tell me where it is) or would you rather me do the lastest download/scan instead? 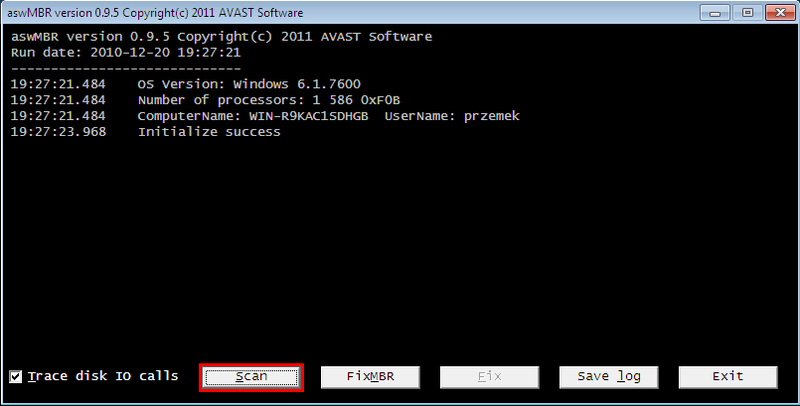 Please just proceed with aswMBR scan as instructed here. 09:20:13.143 Disk 0 MBR has been saved successfully to "C:\Users\BJs\Desktop\MBR.dat"
09:20:13.159 The log file has been saved successfully to "C:\Users\BJs\Desktop\aswMBR.txt"
Hi and sorry for the delay. I was away. Logs looks clean. Can you please give me an update on how your computer's running. Also download RealTemp here, run it and tell me what temperatures are on CPU's cores.